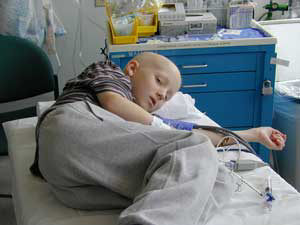 These are photos of me, Jonnie, undergoing a bone marrow aspiration, a diagnostic procedure that leukemia patients like me undergo periodically during treatment. I didn't have much hair then, but it all grew back. The photos were taken at the end of my first year of treatment in May of 2000. 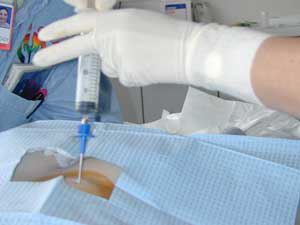 My bone marrow was examined for signs of cancer relapse and everything turned out fine. These photos may be difficult for some people to view, but this is the type of painful and frightening procedure kids with leukemia go through before being rewarded with a toy. I hope these photos will help you see for yourself why an incentive like a toy can help a child overcome fear and discomfort and reward them for their bravery or soothe them in their recovery. These photos are in series. They follow the procedure as it happens. Read them from left to right. 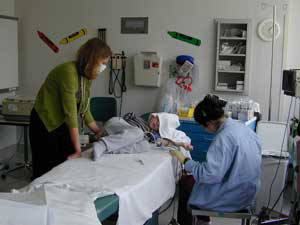 Pictured are Kim, the physician's assistant who will be performing the bone marrow aspiration, me, Jonnie, I'm more comfortable with my head covered during a procedure, and Annie, the nurse taking care of sedation and monitoring my vital signs. 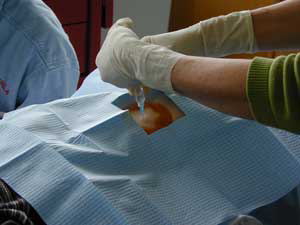 An anesthetic cream called EMLA is used to numb the areas where the bone marrow aspiration and the lumbar puncture will be done. The cream was applied an hour before the procedure started and was covered with tegaderm to keep it in place. Kim is about to remove it. Annie gives me more Versed, a sedative that doesn't put me to sleep like it does some kids, but makes me very drowsy and also makes me forget what happened. She also gives me Fentynal so that most of the procedure doesn't hurt. I can communicate with everyone. Kim tells me what's going on. 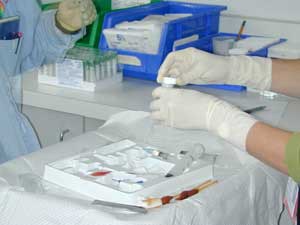 Kim swabs the bone marrow site with a cleaning and disinfecting solution called Betadine. 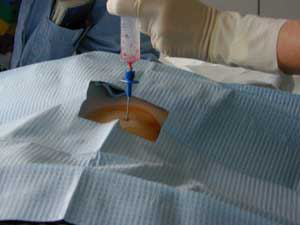 An injection of Lydocaine is given to deaden the pain in the area where the larger bone marrow aspiration needle will be inserted. Now the stainless steel bone marrow needle is inserted into my hip bone. I can feel some pressure, but no pain. A syringe is screwed into the needle. Bone marrow is withdrawn from my hip bone. This does hurt because there is no anesthetic for the pain inside the bone. At this point I am very unhappy and I'm letting everyone know about it in no uncertain terms. Some of my bone marrow is smeared across a piece of glass to make a slide that can be viewed under a microscope. The samples are ready to go to the lab. I'm ready to pick out my toy.